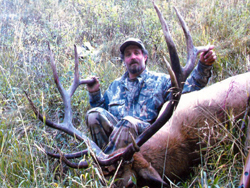 West Elk Wilderness Outfitters is owned and operated by long time Colorado Outfitter and Guides Bruce Mullin. Bruce is an accomplished deer guide, elk guide and sheep guide and had been guiding for the previous West Elk Wilderness Outfitter for over 10 years before recently taking over the business. Guiding in Unit 54 for all those years has given Bruce the opportunity to learn this area and the patterns of the animal that inhabit it better than anyone else. His camp is set 6 to 10 horseback miles into the wilderness area and since this is a true wilderness, motorized vehicles are not permitted. Obviously restricting access to foot or horse traffic limits the number of hunters reaching these back country hunting grounds which provides opportunities that are hard to find anywhere in the west. 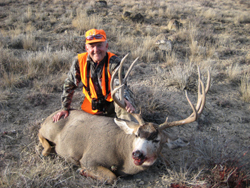 Deer Unit 54 is within the famous Gunnison Basin that is well known for producing some of the biggest trophy mule deer bucks and West Elk Wilderness Outfitters has certainly taken their share of these trophies. This is also elk unit 54 and large populations of elk do haunt these forests. A quick look at their photo gallery is evidence enough of their trophy quality and hunter success. For the hunter lucky enough to draw a tag, sheep unit 54 has produced some exceptional rams over the years and Bruce knows just where to find them. For the hunter looking for a true wilderness experience with a high probability of success, West Elk Wilderness Outfitters is prepared to offer the hunt of a lifetime. Check out their website at West Elk Wilderness Outfitters or contact Hunters Trailhead for more details.